NOT NECESSARILY known for his one-pocket prowess, Earl Strickland has nonetheless progressed deep into the Derby City Classic's one-pocket division the last two years. This past January, a year after his runner-up finish, The Pearl again showed his game has few boundaries as he shot his way into the final rounds of what started as a 311-player field. There, he met Ike Runnels, a fixture on the Chicago pool scene who has a number of top finishes in national amateur league singles and team events. Runnels, well versed in all major disciplines, is no stranger to high-level one-pocket. Strickland, however, quickly jumped out to a 2-0 lead in the race-to-3 match. Strickland then erased a 6-0 deficit in the third game and tied Runnels at 7-7. 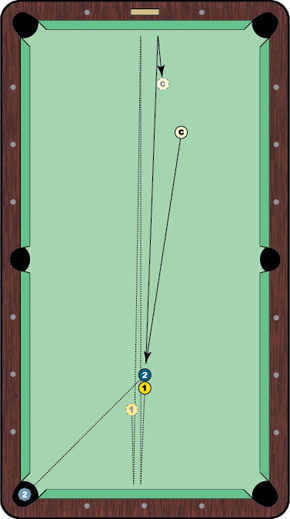 With the game ball deep in Runnels' pocket, Strickland was forced to sink that ball and follow the cue ball into the corner pocket so both balls would then be spotted. Looking at the table shown in the diagram, Runnels erred on the side of aggression. He opted to try to squeeze the 2 ball into the corner while sending the 1 two full table lengths. It was a risky approach, and a play usually reserved for situations where both balls are needed. But the 59-year-old loaded up on draw and sent the cue ball into the 1-2 cluster with medium speed. The 1 ball shot off the short rail and the cue ball jumped back up-table, all while the 2 ball crawled toward the corner pocket. It dropped, giving Runnels the game. But the highlight of the match wasn't enough to propel him to victory; Strickland took the next game to win the set, 3-1, eliminating Runnels in 13th place..